You are here: Home » MEDIA » Books » The Coffee Break Screenwriters 2nd Edition by Pilar Alessandra (book review). The Coffee Break Screenwriters 2nd Edition by Pilar Alessandra (book review). 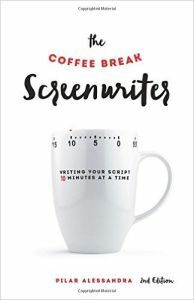 The sub-title of Pilar Alessandra’s book ‘The Coffee Break Screenwriters 2nd Edition’ is ‘Writing Your Script 10 Minutes At A Time’. Basically, she’s applying Parkinson’s Law in that you find a way to fit the time you need to do some work on your script in the time available to do it in every day. Alessandra also point out that it should break you of the habit or endless rewriting because you’ll put your best effort into the first drafts and have that much needed spontaneity. The same would also apply to prose fiction as well as you must surely think through all the scene variants before sitting down at the keyboard and actually typing one up. I find that I often ignore the scenes I’ve thought through but it has led me to the one that I think will work better. A lot of this can also be applied to comic-book scripts and there are lessons for prose writers as well in understanding plot and focusing on what is important to tell the reader. As I was reading, I found myself applying lessons for the story I’m writing this month as every thought my lead character was making needed some serious thought. Alessandra guides you through how to make plot breakdowns and to think about character and action for each scene so you build up your plot map in a simpler fashion than we do in prose. If you have problems with doing this, then this book should put you on the right road. As a side benefit, it can also be used to write the plot précis which you need to have available to show an agent or producer. As Alessandra points out, you don’t have to give them all the plot details, just the direction it takes. I’ve seen enough detailed novel précises to give the comment that you’ve practically written the story better this way than any lengthier version so it’s something to learn from. Knowing the plot elements and, something Alessandra doesn’t point out, is that it also makes it easier to write the scenes you’ve sorted out first and you don’t necessarily have to write the first draft in a linear fashion. This means you can write the scenes you think you’ll be happier with first and use them to get the handle on the tougher scenes you were less sure about. What she does teach is to understand the beats of the plot to get the pace of the story. In simple terms, the ‘beat’ of the story is how long before you do a reveal or an answer to a question you’ve raised. It also allows the emotional impact of what is going on with the characters involved. Much of this is groundwork so you know what you need to add to the first draft or even at a latter polishing stage if you think a scene is flat. With so much going on in a story, this aspect is also something that writers in all formats often forget. It also allows you to map out the characters and mixing their flaws with the obstacles they have to overcome. Having characters that are too perfect or can adapt well to the new and often dangerous situation they are in isn’t always good storytelling. After all, it is adversity with near impossible odds that keeps us watching after all. With SF, I know I have characters that are often more than capable but then I tend to build up a different sort of obstacle course for them to beat. How to create characters, especially how they relate to each other is something that is always worth going over and Alessandra uses several modern examples and shows how giving them flaws ensures interest is maintained. What is important here and something I wholly support is not to write detailed character histories. Apart from tying things down too much, there is a tendency for them to become too samey after a while and I doubt if the reader/viewer is going to worry about which university they went to unless its pertinent to the plot. You can take method acting/writing too far. It’s far more important to know what is happening at the time of the story and any back story as far as that concerns. For scriptwriting of TV characters, it also gives flexibility to develop things from what is seen presented by the actors. Although Alessandra points out that the common screenwriting software ‘Final Draft’ is the one of choice, I’m less sure at the time it takes to change it using ‘Word’. After all, you only need to highlight and use ‘Center’ for line position and ‘Change Case’ to do a total capping of words. When you see the cost of ‘Final Draft’, I have a feeling that you’ll see that benefit until you can afford to buy it. With scripting itself, once all the preparation is done, the first draft is more to get the basics down before embellishing. This is sort of what I’ve suggested in the past although I would go as far as do the scenes you know how to complete first because it will help find the character voices easier. The emphasis against doing ‘talking heads’ is even more important. With prose, you don’t have to worry too much because the mind’s eye fills its own gaps and the reader will accept those protocols. With film or TV, the actors and director have to find the best way to put over what the dialogue demands. I do wonder about just how much should the scriptwriter put in for their own directions because the final production can always change so much, let alone when other scriptwriters are brought in. Something that is emphasised and often forgotten in our own genre is characters are allowed to lie or at least not to be necessarily honest to each other all the time or conventional lies about health and well-being or talk around the truth. Alessandra says by allowing them to lie portrays the script’s own honesty. A lot of this comes from listening to a lot of people speaking and look for undertones of what is really meant if you want to develop different voices. I suspect writers feel that they have to be honest to the reader or think they won’t catch on. We’ve all been guilty of that but it’s a useful lesson to let sink in to dimensionalise your characters. One area where scripts can often do better is when less is more and finding the classic line when a paragraph of dialogue would be too much. Her examples of this hail from the likes of ‘The Graduate’ and ‘Jaws’ amongst others. If you can draw up any particular line you remember, then that’s the sort of script immortality all writers are looking for because it enters the public consciousness and forever quoted. Something I might add is people do not talk together in paragraphs, so apply that lesson to any dialogue in any medium. As Alessandra demonstrates with the film medium you can have too much dialogue. I did wonder about that and suspect most writers think they get paid by the word. All right, maybe in prose, but it is the reverse in film as you need to say much in less. This is where real thinking takes place and why you have to go over your script in a thorough way. Alessandra gives a list of things to check and I suspect many of you will be using this book until it becomes second nature. There is also a lot of guidance in how to literally cut a scene to remove information that you don’t need. In prose, you have to set the scene. On screen, you can instantly see it’s a restaurant or whatever. Anything beyond that is up to the production team to design. After reading page 207, I wouldn’t let Alessandra near receptionists. Once the script is completed, Alessandra guides you through copyrighting issues but only for the American market, which isn’t quite the same as the UK version, and creating a one minute presentation to convince a producer to at least look at your material. She only cites cornering one of this crowd at a cocktail party but there’s still a question of getting an invite and no mention of agent representation, other than how to send them a query letter. Bear in mind, this end of the book is for the American market. Her chapter ‘The Opportunity’ looks at networking and how to make first contact with anyone from agents to producers and even other scriptwriters. Much of this appears to be targeting the Hollywood area although if where you live has any studios, then it might work elsewhere. I’m less sure about it working in the UK but getting to know the right people probably doesn’t hurt, although bear in mind many of them are working as well and might not have the time. Finally, at the end, Alessandra gets quotes from scriptwriters in the industry and I have to take a wry smile at scriptwriter Andrew Robinson about spellchecking both computerised and human because he hasn’t noticed, like many other people, the difference between ‘either’ and ‘neither’ within a paragraph of each other. As you should know by now, whenever I do a long review, you’re seeing a lot of what I either agreed with, discuss, add or disagree with about a book. Most of it, are things that I wholly agree with and also think they can apply across the writing mediums. Writing is writing after all and if you come away from this book with a greater understanding and application of writing techniques then it can only enhance your skill. ‘The Coffee Break Screenwriters’ surely qualifies for that and should be read by any writer or novice in the writing medium. I should point out that this edition is released 01 May 2016 in the USA and in the UK on 01 July 2016. « The Upside Of Downtime by Sandi Mann (book review).